With a football tradition dating back well over 100 years, students at Farmington High School have seen just about every type of pep rally there is, you might say. If you did think that, you would be wrong! 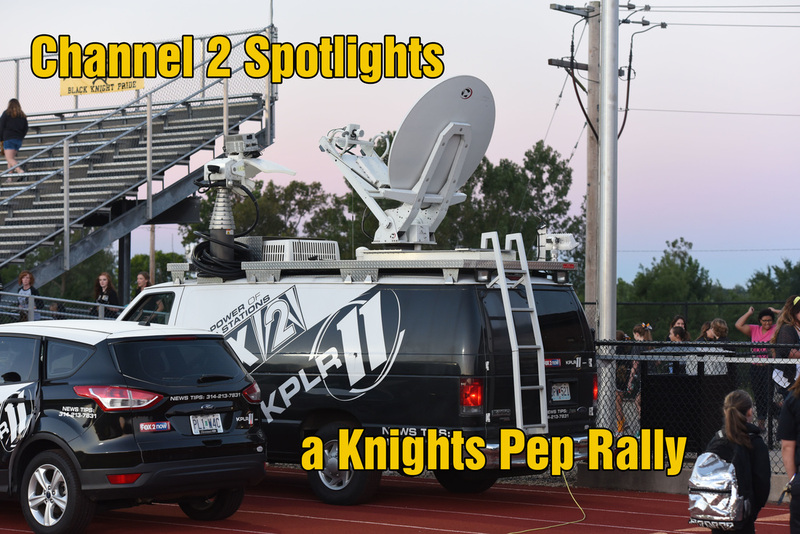 Because students at FHS on September 2 made history (beginning at 6:30 a.m.) with yet a new type of Pep Rally: A Channel 2 Pep Rally! And what made this one so spectacular is the fact that much of this 2-hour event was broadcast live so that viewers in the St. Louis station's total television signal range could also share in the fun! Our hats go off to the planners of this awesome event. Not only was there the traditional fare with cheerleaders, the band, the dance team –and of course, the football team-- but there was also wild enthusiasm, a fireman's race of sorts that involved quick clothing changes, and there was also a Buffalo Hot Wings eating contest, and a rope tug of war. Adding to the exciting atmosphere of fun was the most unusual element of all: the personal participation of Channel 2 news personality Chris Regnier. Also unusual is the fact that different aspects of the pep rally were broadcast at different times all through the Channel 2's morning newscast. Instead of this being just a normal case of spot reporting, the FHS event became a happening! We loved having the Channel 2 news team in our town and at our high school, and we would love to see a repeat performance of this spectacular show again someday in the future!